Enjoy a leisurely exploration of Ireland, from Waterford in the south to the northern mythical land of Finn MacCool, the giant whose 'causeway' enjoys World Heritage Site status. Embrace the warm welcome of the Emerald Isle - its ancient heritage, legends and lore are yours to explore as you travel the length and breadth of this island and its tale of two nations. The charismatic capital of Dublin is our first stop on this epic journey, which begins as you join your Travel Director and travel companions on a canal boat for a Welcome Reception on Dublin's 200-year-old Grand Canal. Belfast beckons today and we journey to Northern Ireland for some time at leisure in this vibrant city. Join a Local Specialist to view the historic murals splashed across the walls of the nationalist and loyalist areas, and see the City Hall. 'Dive Into Culture' at the Titanic Belfast Visitor Centre and gain a new perspective into the world's most famous ship and the tragedy that befell it. This evening, we dine in our hotel. Tread in the footsteps of Finn MacCool - his geometric Giant's Causeway is more the stuff of legends than the result of ancient volcanic activity which left its mark on the Northern Irish coast. Admire the 40,000 interlocking basalt columns that fade into the sea, then journey through the enchanting tunnel of the Dark Hedges. After a day of myths, legends and Hollywood blockbusters, consider tucking into an optional Fish and Chips pub dinner. Traversing Northern Ireland, we arrive at the old walled city of Londonderry on the Foyle River, where we join a Local Specialist who will take us to its most iconic sights. Delving into the former struggles of the region, we visit the People's Gallery of murals in Bogside to view its poignant murals. We journey to County Donegal later, where we will spend the next two nights. This evening, enjoy a tasty dinner in our hotel. 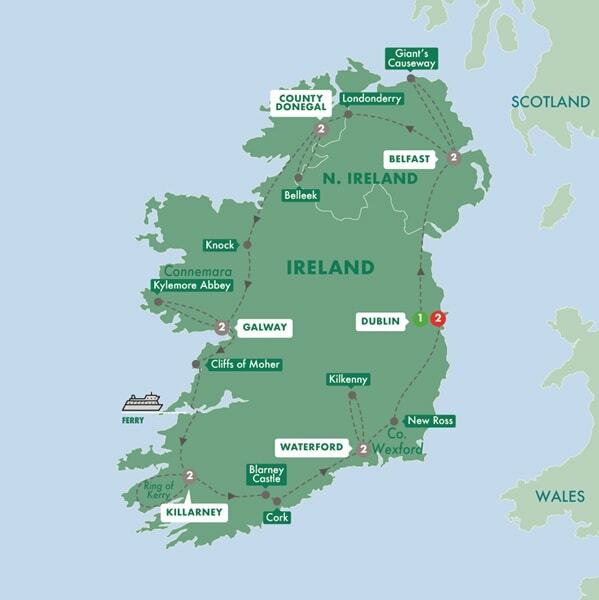 Explore the town of Donegal located at the mouth of the River Eske and Donegal Bay. Consider visiting the ancient Donegal Castle, once the stronghold of the O'Donnell clan. This afternoon, we visit Belleek where we'll 'Dive Into Culture' and learn about the locally made Irish pottery for which the region is famous. In the pilgrimage town of Knock, we visit the beautiful Marian Shrine where the Virgin Mary, Saint Joseph, and John the Evangelist are said to have made an appearance to the townsfolk in 1879. We continue to County Galway before enjoying dinner at our hotel. The untamed landscapes of Connemara, set against rugged mountains and tranquil loughs, provide a soul-stirring backdrop for your scenic drive to Kylemore Abbey. This Benedictine monastery, built on the grounds of Kylemore Castle, features a magnificent Victorian Walled Garden, which we will have an opportunity to explore before returning to Galway. This afternoon, spend your free time exploring Galway's vibrant Latin Quarter, striking stone Cathedral or the 18th-century Eyre Square. Our encounter with the rugged beauty of Ireland continues as we see the spectacular Cliffs of Moher plunging into the wild Atlantic over 200 metres below. The history of these inspiring cliffs is brought to life at the "Atlantic Edge" exhibition, before we journey along the scenic coastal route, through County Clare bound for Killarney. This evening is yours to spend as you wish, but perhaps we can tempt you with a bit of craic at a traditional Irish ceilidh to soak up the town's festive atmosphere. Circle the mystical Ring of Kerry - among Ireland's most enchanting landscapes along which we'll have an opportunity to view the island's ancient history. Travel through Moll's Gap and take a moment to view the marvellous natural scenery at Ladies View. This evening is at leisure. Your 'gift of the gab' secured after kissing the Blarney Stone this morning, we venture to Cork where we spend some time exploring the cosmopolitan city that rivals Dublin in its energy and charisma. Spend some free time visiting the famous food market or perhaps relax at one of the city's tearooms, indulging in fresh scones and tea. Our final stop today is in medieval Waterford where we'll spend the next two nights. A leisurely start to your morning could see you amble along Meagher's Quay, before you visit the House of Waterford, where you'll 'Dive Into Culture' and witness the art of creating the exquisite crystal. 'Dive Into Culture' again with a visit of Kilkenny Castle, an Anglo-Norman castle that sits majestically over the Nore River. We spent the rest of the afternoon on our own in Waterford, though you may wish to consider joining an Optional Experience trying your hand at Ireland's national sport, 'hurling'. Traverse beautiful County Wexford to the John F. Kennedy Arboretum - a peaceful retreat in New Ross with over 4,500 species of plants across 252 hectares dedicated to the former American president. We leave the enchanting outdoors behind and take a step back in time to the 1800s as we visit the three-masted Famine Ship Dunbrody. We'll 'Dive Wnto Culture', gaining insight into the tragic plight of the Irish emigrants, who were compelled to leave their home during the potato famine and endured even harsher conditions than at home in the "coffin ships" that took them to new lands. This evening, we join the Fulvio family and 'Connect With Locals' over a Be My Guest dinner featuring Irish fare with an Italian twist, served at their Glenealy Farmhouse near Dublin. We wander through Dublin this morning, joining a Local Specialist for a superb sightseeing tour that will see us view Trinity College and the magnificent Georgian Squares. Spend the rest of the day exploring the city on your terms. Indulge in a pint of 'the Black Stuff' at one of its many quaint pubs, admire the colourful performances on Grafton Street, or delve into its centuries-old history. This evening, let the rousing sounds of a traditional Irish cabaret tempt you for an Optional Experience that will have you dancing your way through the Dublin streets. Our memorable journey through Ireland is at its end. All that's left to say is slán abhaile to newfound friends as you prepare to depart home. Transfers are available. Conditions apply.